Please note: you must be an IDE student to participate, or partner up with an IDE student. Please note: you can only use the elective points in your curriculum if you are doing a Master programme, and only if you have not received points on this course code before. If you are not a Master student at the faculty of IDE, check with your academic counsellor if you are allowed to include this course in your curriculum. If you choose to participate with a partner, at least one of you MUST BE an IDE student. Both partners have to fill in a full application form. 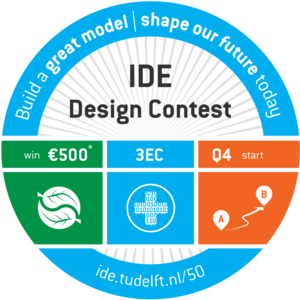 By submitting this form, you officially apply for the IDE Design Contest. Active participation and communication is required. You have read and understood the conditions for application. What are you using this data for? We collect this data so we can contact you and properly administrate the design contest and the elective (if applicable). The information about your education is used to determine if you qualify for credits, if you are allowed to participate in the contest, and for analytical purposes. The data you enter here will only be stored and used for this design contest and elective, and the resulting exhibition and symposium. After the jubilee activities have fully ended and there is no reasonable need to access this data for these purposes anymore, or after a maximum of one year after the end of the exhibition, the data will be removed.